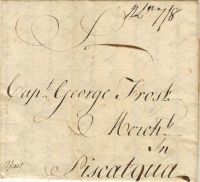 Description: N-York (Type J) townmark on Stampless folded letter with manuscript "Free" from Eleazer Miller Jr. to Norwich Postmaster, Dudley Woodbridge. 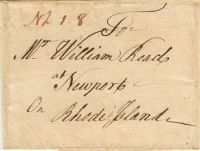 Description: N. YORK (Type K1) on Stampless folded letter with hanstamped "FREE" (22x4.5mm) from Danl Phonir to Postmaster Dudley Woodbridge. 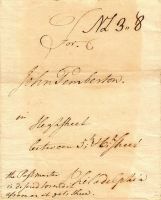 Description: Perfectly struck Richmond circular dated cancel on Confederate cover to Manson PO, Warren County, NC. Description: Stampless, folded cover docketed New London, September 1766. Rated (NL 1.8) in majenta for the "Not over 60 mile rate"
Description: 279B, tied by Flag cancel on Hazard Power advertising cover, Very Fine. 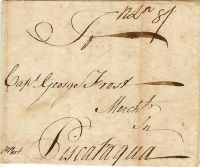 Description: Cover sent from New York City to Fortress Monroe in occupied CSA Virginia. 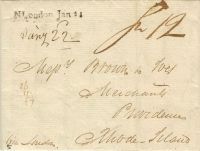 1857 3 cent stamp with 1 cent stamp for Carriers' fee. Description: Parcel tag Zone 2 insured special handling (how 54c rate was determined is not clear). Description: Special delivery failed due to business being closed - courtesy label attached to the reverse. Description: 10c special delivery stamp added to pre-paid courtesy reply envelope. Description: 20c parcel post stamp on cover (only) from a package of Yellowstone Park postcards. Description: 10c special handling and 11c Prexie on parcel from book publisher (no year date). 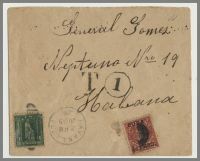 Description: Patriotic cover with soldier's letter handstamp and 2c due. Description: 10c special delivery on Spanish-American War patriotic flag cover - local use with "Buttonwoods (Beach)" postmark. Description: 10c special delivery on Spanish-American War patriotic advertising cover. Description: Block of 12 $1 4th Bureau stamps on Worden cover - first experimental night flight NYC to San Francisco (train to LA). 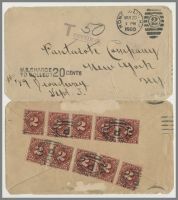 Description: 2c and 10c parcel post stamps on registered courtesy reply envelope. Description: 15c parcel post stamp paying 5c surface rate plus 10c registration fee.